Silvopasture systems comprise trees deliberately introduced into a forage production system (or, rarely, forage introduced into a tree production system), the whole designed to produce a high-value tree component, while continuing to produce the forage and livestock component indefinitely or for a significant time. Forage system: usually permanent pasture, grazed rotationally. Other options are pasture cut for hay or silage. White clover (especially wild types) is more shade-tolerant than other pasture legumes and should be included in mixtures. Browsing animals are more likely to damage trees than large grazing animals or poultry. Deciduous trees are more readily browsed than conifers. Tree component: may be timber or fuelwood trees, or a fruit or nut crop. Nitrogen-fixing trees can also be used to supply nitrogen for the forage crop. Trees are grown as standards or as pollards. For more information on tree species choice in Britain, see Selecting timber tree species. Fruit crops as the tree component are usually grown as standards to allow for grazing beneath. Apples, cider apples and plums are some of the possibilities. Nut crops can include chestnuts and hazelnuts. Walnuts are slow growing and are only suitable if animals are excluded or if a cheap form of tree protection is available. 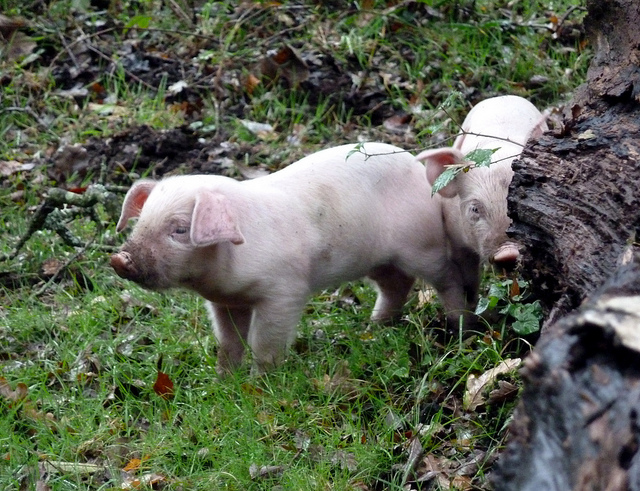 Pigs are forest dwellers in nature, and perform excellently in a controlled agroforestry system. Silvoarable systems (eg. with walnut or other trees not suited to silvopasture when young) can be converted to silvopasture when arable yields start to reduce from competition after 10-20 years. Livestock management is crucial to avoid tree damage by grazing, trampling and rubbing. This may involve seasonal exclusion when trees are most vulnerable, locating salt/mineral licks to encourage uniform livestock distribution, rotational grazing in sub-units etc. Grazing can control grass competition with trees for moisture and nutrients and reduce habitat for gnawing rodents. Trees can be planted evenly at wide spacing (eg. 10 x 10 m), in rows with forage alleys (of 10-30 m width) between, or in clusters. All methods necessitate some form of weed control – black plastic mulches produce the best tree growth. Even wide spacing: means that trees have to be individually protected from stock – expensive – unless the forage is cut for hay/silage for the first few years until trees are large enough. Trees also have to have individual weed control measures. Research suggests that deciduous trees planted this way into pasture have no detrimental effect on pasture and livestock production for at least 10 years. Forage production falls off rapidly, though, once trees exceed about 35% canopy cover. Row planting: allows trees to be planted more closely, if desired, for later thinning. Also allows for block weed control measures, eg. black polythene strip. Tree protection against stock can be significantly cheaper by using straight fences or electric wire/netting. Also allows for easier access for mowing etc. Both single and double rows of crop trees can be used; a further alternative is a triple row, with high-value crop trees sandwiched between rows of nurse trees (usually coniferous) which help train straight crop trees and are themselves thinned at a later stage. Rows are best aligned North-South. Cluster planting: has the same potential advantages as row planting. Also, shade effects on the forage crop are more localised. Good where exposure is a problem, as trees within the cluster will be more sheltered. Trees provide shade and wind protection, which reduce heat stress and windchill of livestock; performance is improved and mortality reduced. Economic returns from forage/livestock production continue while creating a sustainable system with environmental benefits. Can be designed for little or no long-term reduction of forage production whilst growing other crop(s) on the same site. The combined tree plus forage productivity of silvopastures can substantially exceed that of pastures or forests grown alone. Main one is the cost of protecting trees from livestock, which in wide plantings can be more than the trees themselves. If trees are subsequently pollarded, this will remove the time and cost involved in restocking the tree component. Many high-value deciduous timber trees grow with poor (crooked) form without the sideways light pressure of a forest. Correction pruning and/or the use of nurse trees can overcome some of this problem.